What is resilience, and how can you build it? 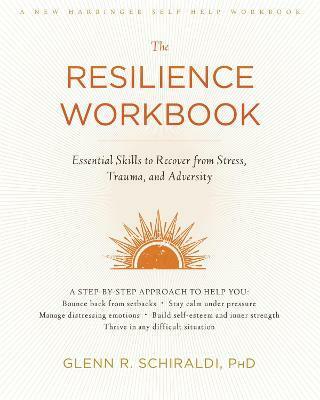 In The Resilience Workbook, Glenn Schiraldi-author of The Self-Esteem Workbook-offers invaluable insight and outlines essential skills to help you bounce back from setbacks and cultivate a growth mindset. Why do some people sail through life's storms, while others are knocked down? Resilience is the key. Resilience is the ability to recover from difficult experiences, such as death of loved one, job loss, serious illness, terrorist attacks, or even just daily stressors and challenges. Resilience is the strength of body, mind, and character that enables people to respond well to adversity. In short, resilience is the cornerstone of mental health. Combining evidence-based approaches including positive psychology, cognitive behavioral therapy (CBT), acceptance and commitment therapy (ACT), mindfulness, and relaxation, The Resilience Workbook will show you how to bounce back and thrive in any difficult situation. You'll learn how to harness the power of your brain's natural neuroplasticity; manage strong, distressing emotions; and improve mood and overall well-being. You'll also discover powerful skills to help you prevent and recover from stress-related conditions like post-traumatic stress disorder (PTSD), anxiety, depression, anger, and substance abuse disorders. When the going gets tough, you need real, proven-effective skills to manage your stress and heal from setbacks. The comprehensive and practical exercises in this workbook will help you cultivate resilience, stay calm under pressure, and face all of life's challenges. "The importance of resilience in sports, the workplace, and life is far from a new concept. However, Schiraldi has provided one of the first truly comprehensive overviews of this critical human strength. Filled with practical advice, drills, skills, exercises, and real-life anecdotes, this guide offers us mental armor to fight the simple life challenges and daily frustrations that confront us all, in addition to the more serious and sobering anxiety, stress-provoking, and life-threatening challenges. The take-home message underscores the importance of building a mental and emotional structure that can weather a storm, and this book provides a well-researched and highly practical blueprint." --Spencer Wood, PhD, member of the Association for Applied Sport Psychology, and president of Icebox Athlete Mental Skills & Toughness Training "A remarkably comprehensive, yet accessible and practical, treatise on resilience. I really believe that everyone will benefit from reading and using it. While this book will certainly benefit high-risk groups, it is also a great how-to and must-read for business professionals, entrepreneurs, students, parents, and anyone else who experiences stress and adversity." --Alan D. Boss, PhD, assistant professor of business at the University of Washington Bothell "This is a great book! Comprehensive, authoritative, understandable, and practical. Schiraldi has pulled together the current research for mind and body, and produced a 'how-to' guide to inoculate you and those you care about against the inevitable trials of life. Even better, it is a guide to healthy, happy, fulfilling living in general. I'm getting a copy for every member of my family." --Thomas W. Garrett, retired major general of the US Army "With extensive experience in mental health, academic, international crisis, and military environments, Glenn Schiraldi is uniquely prepared to offer excellent and expert guidance in developing and maintaining resilience--clarifying the best principles and practices for optimizing our physical, mental, emotional, and spiritual health and fitness under challenging circumstances. As in his previous books, Schiraldi again offers wise, caring, comprehensive, and accessible guidance. We can rely on him with trust and confidence for negotiating life's challenges." --Edward Tick, PhD, author of War and the Soul, director of Soldier's Heart (for successful warriors return), and clinical psychotherapist focusing on veterans issues "Resilience is the final frontier in human psychology. Schiraldi has created a wonderful resource and valuable compendium of academic science and practical behavioral suggestions--a powerful foundation for the acquisition of resilience skills." --George S. Everly Jr., PhD, Johns Hopkins University School of Medicine; executive director of Resiliency Science Institutes, International; and coauthor of The Secrets of Resilient Leadership "Schiraldi goes beyond preparing or finding a way back. This resilience guide leads us to higher ground. It is the very best I have seen for both pre-occurrence preparedness and post-exposure recovery--providing greatly encouraging, comprehensive growth and integration, especially in the core values of spirituality, meditation, religion, ethics, and morality." --Glenn Calkins, MDIV, LCSW, BCC, firefighter, EMT, fire chaplain, and certified supervisor of the Association for Clinical Pastoral Education "Life's trials are inevitable. How we respond to them is a product of the resilience we consciously develop, and Schiraldi shows us how." --Greg Baer, MD, author of Real Love and Post-Childhood Stress Disorder "The Resilience Workbook is clearly the authoritative work in the field. Schiraldi methodically takes the reader through the three critical steps of resilience training: gaining a basic understanding of the critical issues of resilience, helping the reader determine his or her own level of resilience, then guiding the reader through step-by-step exercises to build and maintain a resilient mind. Clearly a seminal work in the field of resilience." --Steve O. Steff, PhD, president and CEO of Crisis Care International "This book is written for any person at any level of emotional health. The true beauty is that individuals--be they professionals looking to enhance their skills or people struggling with their own tragedies--can implement the strategies in their own life, and then use them to strengthen and help others. This guide will be a boon to every parent and homemaker. Nearly every chapter has something I'll use on a daily basis. As a mother and a counselor, I deeply appreciate Schiraldi's expertise and insight. An amazing book." Glenn R. Schiraldi, PhD, has served on the stress management faculties at the Pentagon, the International Critical Incident Stress Foundation, and the University of Maryland, where he received the Outstanding Teaching Award and other teaching and service awards. His books on stress-related topics have been translated into nine foreign languages. Schiraldi's writing has been recognized by various scholarly and popular sources, including The Washington Post, the American Journal of Health Promotion, the Mind/Body Health Review, and the International Stress and Tension Control Society Newsletter. Schiraldi's special passion is presenting skills-based resilience training to high-risk groups, such as the military, police, firefighters, and their families. The goal of such training is to optimize mental fitness and performance, while preventing, and facilitating recovery from, stress-related conditions such as post-traumatic stress disorder (PTSD). His resilience courses at the University of Maryland have been found to improve resilience, optimism, self-esteem, happiness, curiosity, depression, anxiety, and anger.